Beautiful apartment on floor 9, with two terraces of 50 m2 and 10 m2 with spectacular views of the city and the Bay of Cadiz. Completely renovated, tastefully decorated. Ideal situation. Close to train station and bus stops. A beaches and city center. Everything is close. Ideal for couples. In addition to the clothing house, you have umbrella, towels and chairs for the beach. And also 2 fantastic sunbeds for sunbathing on the terrace. Public parking in front of the building (not included in the price). The apartment was only 5-10 minutes walk from the railway station along the main road. Despite this we still managed to get lost due to poor map reading skills and Cristina very patiently waited for us outside the building. 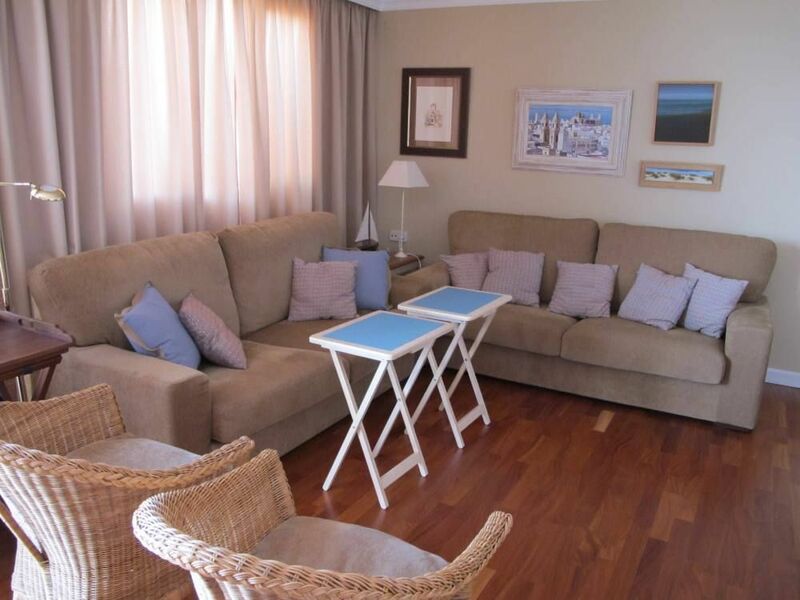 The flat is homely with very comfortable furniture and plenty of space for two. It is very well equipped and there is a microwave instead of an oven. There is air conditioning in the living room but not in the bedroom. The shower is perfect. The terrace is huge with lovely flowers and plants - a good place to sit and watch the coming and going of the cruise ships. Cristina was very helpful with all the local information and recommendations,and was quick to respond with any queries. An excellent host. Excellent apartment, views and location. Just a fantastic holiday. Exactly what we needed. Beautiful, comfortable apartment . Breathing spectacular views of both the marina to the front and the old town from the back balcony. Cristina the owner was very helpful with information on places to eat, shop and visit. Everything we needed was supplied and she even went the extra mile and printed and personally delivered our boarding cards. Lots of little kind extras included like salt, herbs etc. Plenty of kitchen implements, glasses and very important a freezer for ice cubes. Very comfortable spacious apartment. Wonderful choice of music cds provided also. All in all a great apartment and a delightful hostess. The apartment was very comfortable and well equipped. Only a short walk from the centre of the town and the brilliant fish market. Easy arrival as it is very close to the train station and buses. Public parking Canalejas front of the building.